My short story Aardvark Tales now has a release date of 30th November and is available for pre-order now. To celebrate I wanted to share with you a very short extract of the story. About this time yesterday, just after nap time and not long from breakfast, Aardvark decided to go on an adventure. Now Aardvark was a rather humpf-ish sort of a character, by which I mean he got a bit grouchy when he was hungry, or when he was tired, or when he had to do something different, well you get the idea. Despite his humpf-ish nature he was the best friend a little girl could have and he was the most magnificent shining shade of orange, if you looked at him you could distinguish all the colours of autumn and embellished rust on an old iron gate, to see him was to love him. And maybe due to the size of his marvellous snout he had a nose for adventure (and chocolate ants, his favourite snack). This tale begins with Aardvark in a particularly humpf-ish mood about to go on an adventure, on his own. Evie was at school, otherwise he would have taken her with him. He perched on the edge of the bed and jumped through a swirling portal. The portal itself was a luminescent whirlpool of colours and magic, leading to a land of adventures. He turned around and almost immediately bumped into a purplish thingy. “Ouch that hurt.” Said the purplish thingy. “Humpf!” Aardvark exclaimed, rubbing his nose crossly. They looked at each other with suspicion. The purplish thingy had four legs and was furry all over. He had a mane like hair framing his face and all in all he looked rather cute – Evie would certainly have thought so but aardvarks can be less liberal with their praise. “What ARE you?” Aardvark said rudely. He felt rude because he hadn’t eaten for at least five minutes. Neither creature spoke for a second and a gust of wind ruffled the growler’s rather handsome mane. “It’s short for Aardvarktageous the 7th.” Aardvark added somewhat confusingly. “Pleased to meet you Aardvark.” Graham said. “What is a growler?” Aardvark asked. “Each time a roar is let out a Growler comes into being. We like hiding things… And baking.” Graham said with a giggle. “Great.” Said Aardvark, the merest mention of food cheering away the last of his morning humpfs. “Would you like to meet my friends?” Growled Graham. Aardvark nodded his impressive snout and followed the growler through the trees. John de Gruyther has asserted his right under the Copyright, Designs and Patent act 1988 to be identified as the author of this work. 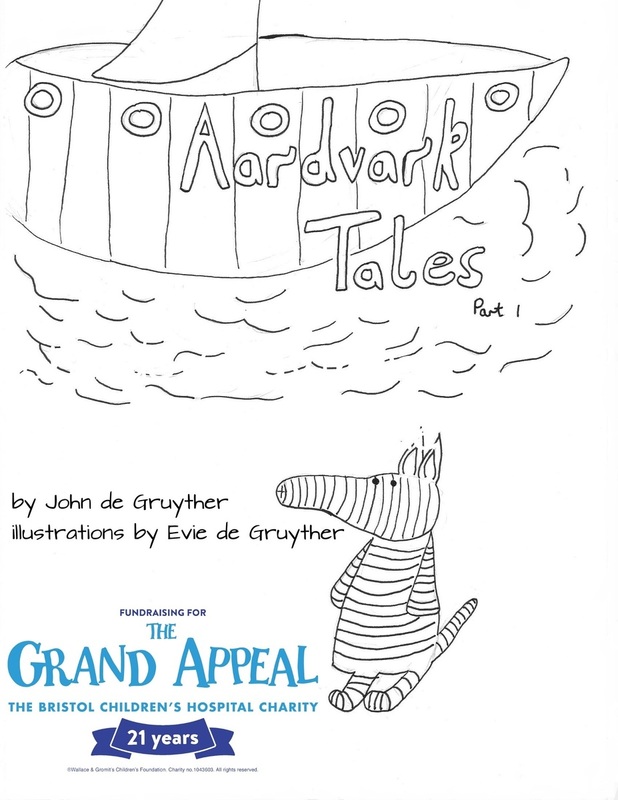 All profits from the sale of this book are being donated to the Grand Appeal to support the work of Bristol Children’s hospital.